Telstra Archives · Stop the Cap! The Australian government’s proposal to launch a nationwide fiber to the home National Broadband Network (NBN) has been scrapped by the more conservative Liberal-National Coalition that replaced the Labor government in a recent election. As a result, the Coalition has announced initial plans to revise the NBN with a mixture of cheaper technology that can result in faster deployment of lower speed broadband at a lower cost. If implemented, fiber to the home service will only reach a minority of homes. In its place, cable broadband may be the dominant technology where cable companies already operate. For almost everyone else, technology comparable to AT&T U-verse is the favored choice of the new government, mixing fiber-to-the-neighborhood with existing copper wires into homes..
Just a year earlier Telstra, Australia’s largest phone company, was planning to decommission and scrap its copper landline network, considered “five minutes to midnight” back in 2003 by Telstra’s head of government and corporate affairs, Tony Warren. Now the country will effectively embrace copper technology once more with an incremental DSL upgrade, forfeiting speeds of up to 1,000Mbps over fiber in return for a minimum speed guarantee from the government of 24Mbps over VDSL. The turnabout has massive implications for current providers. Telstra, which expected to see its prominence in Australian broadband diminished under Labor’s NBN is once again a rising star. The Liberal-National Coalition government appointed Telstra’s former CEO Ziggy Switkowski to run a “rebooted” Coalition NBN that critics are now calling Telstra 3.0. 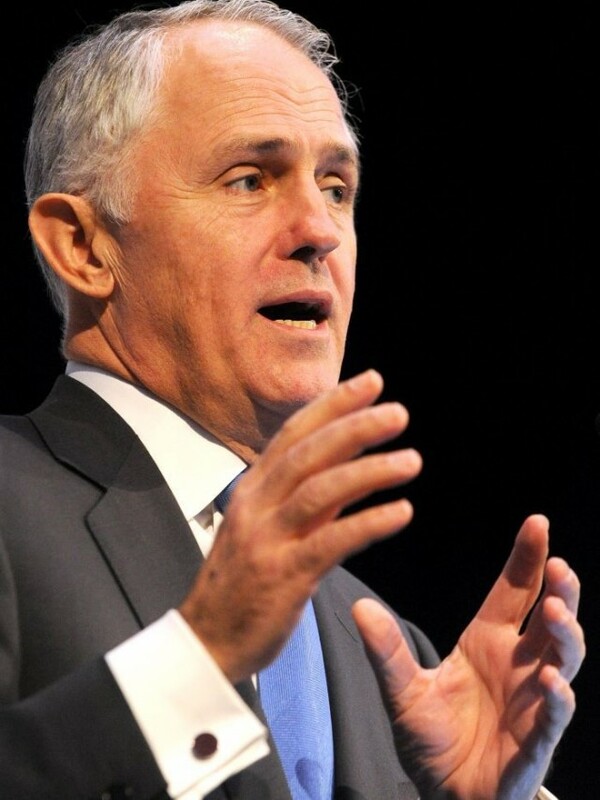 Communications Minister Malcolm Turnbull also installed three new members of the NBN’s governing board consisting of a Telstra executive, a founder of a commercial Internet Service Provider, and an ex-construction boss who left the NBN in 2011. Some Australians complain that NBN’s proposed reliance on Telstra copper is a mistake. Telstra has allowed its landline infrastructure to decline over the years and many are skeptical they will ever see faster speeds promised over wiring put in place decades earlier. The NBN under the Liberal-National Coalition will depend heavily on two copper-based technologies to deliver speed enhancements: VDSL and vectoring. Both require short runs of well-maintained copper wiring to deliver peak performance. The longer the copper line, the worse it will perform. If that line is compromised, VDSL and vectoring are unlikely to make much difference, as AT&T has discovered in its effort to roll out faster U-verse speeds, much to the frustration of customers that cannot upgrade until AT&T invests in cleaning up its troubled copper network. Coalition critics also warn the new government will foolishly spend less on a fiber-copper network today that will need expensive fiber upgrades tomorrow. 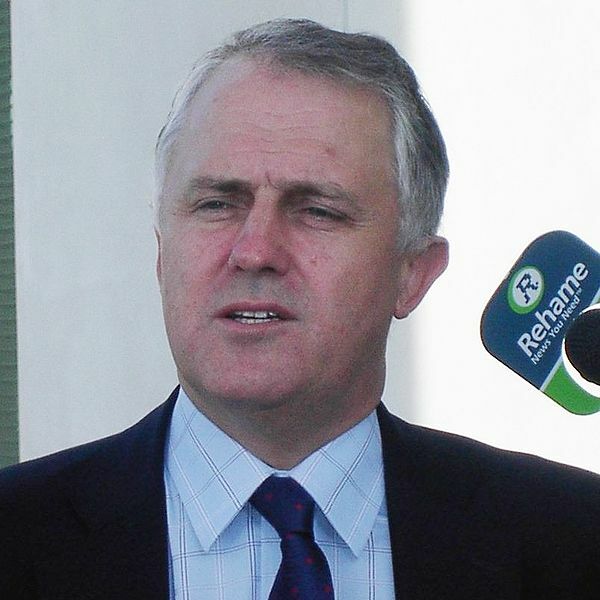 Turnbull isn’t happy with Australia’s mainstream media for lazy reporting on the issues. The promise of fiber optic broadband may prove elusive under the new government. 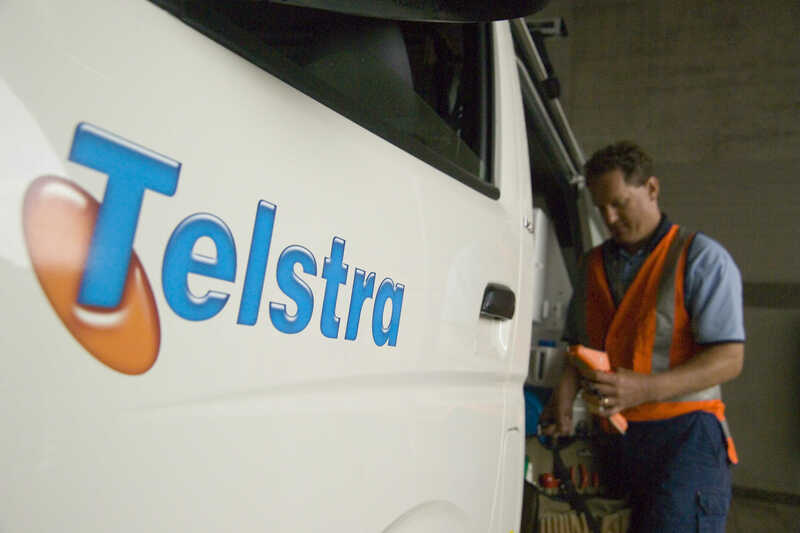 With much of the new NBN dependent on Telstra’s copper telephone network, Stuart Lee, Telstra’s managing director of its wholesale division, rushed to defend the suitability of the same copper network Telstra was prepared to scrap under the last government. When questioned about several recent high-profile mass service disruptions Australians experienced on Telstra’s landline copper network, Lee blamed the weather, not the network. “They correlate to weather events, and the weather events we’ve had in the last [few years] is about five to six times the previous ones, so surprise surprise there is a lot more damage,” said Lee. The new government has charged the Labor-run NBN with inefficiency, taxpayer-funded waste, and playing politics with broadband by giving high priority to fiber upgrades in constituencies served by threatened Labor MPs. Lee added NBN Co has played loose with the facts, declaring premises “passed” by the new fiber network without allowing customers to order service on the new network. That can become a serious problem, because the NBN plan calls for customers’ existing copper phone and DSL service to be decommissioned soon after the fiber network becomes available. 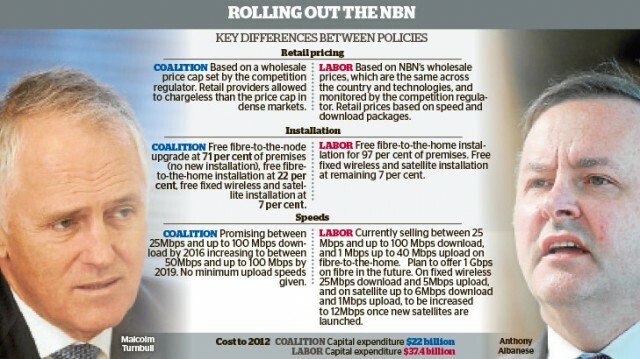 The Sydney Morning Herald compared the last Labor government’s broadband policy with the new Coalition government policy. The Labor government’s NBN has also been under fire for a pricing formula that includes a usage component when setting prices. Impenetrably named the “connectivity virtual circuit” charge, or CVC, the NBN charges retail providers a monthly connection fee for each customer and a usage charge that includes a virtual data allowance originally set at 30GB. Retail providers are billed extra when customers exceed the informal allowance. Although the government promised to reduce the charges, they effectively haven’t and likely won’t until 2017. Lindsay called the CVC an artificial tax comparable to the Labor government’s carbon tax, and represents a digital barrier to limit customer usage. “It’s a tax on packets,” Lindsay said. Telstra, Australia’s dominant telecommunications company, is openly concerned about the prospect of Australians finally shedding themselves from Internet Overcharging schemes like low usage caps and throttled speed. But instead of doing away with these profit-boosting schemes themselves, they’ve decided to argue that consumers don’t need the country’s newest 1TB usage allowance plans, calling them publicity gimmicks. Of course, Telstra doesn’t offer a 1TB plan. A terabyte is a lot of data. 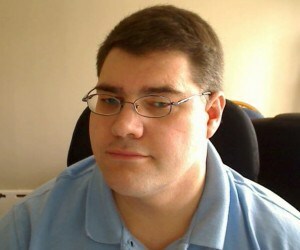 One provider claimed it’s enough to download about 200 DVD quality movies and still have quota left over. Whilst my inner geek is salivating at the possibilities, the analyst in me is questioning just how many people currently need, or could even use, a terabyte of data each and every month. Gibson believes the average Australian is better off plans like Telstra’s 50GB DSL service, running $49.30US per month on a two-year contract. When all the charges and fees are totaled, Australians will pay Mr. Gibson’s company $2,364.50US for two years of service that slows to 64kbps once your monthly 50GB allotment is used up. Australians have already made that decision and they have been voting with their feet to other providers. On the same day Gibson was dismissing the competition, Telstra CEO David Thodey was responding to it, recognizing the company has lost significant market share because of high prices and poor customer service. He told The Advertiser improvements were underway. “The focus on customer service is something that is innate within Telstra, but our delivery leaves a lot to be desired,” he said. So is their pricing. Gibson’s views defending rationed Internet service are similar to the arguments broadband providers in the States use to defend their failure to keep up in the global broadband speed race. Only instead of dismissing the need for unlimited service, American providers try and convince customers they don’t need the faster speeds they don’t deliver. Imagine if you lived in a country where broadband competition actually delivered real innovation and savings, overseen by a consumer protection agency that made sure providers in a barely competitive marketplace actually delivered on their “highly competitive” rhetoric. Australia’s National Broadband Network (NBN) will deliver exactly that, with a check and balance system that makes sure advertiser claims meet reality and that “robust competition” means… robust competition. One industry-backed front group, Digital Society, doesn’t think that idea is fair to big telecom companies (like those funding its operations), and wants none of that here in the States. Internet Service Providers in Australia will be forced to compete with each other via the “Competition and Consumer Commission”. The problem with this is that a supposedly ubiquitous commission deciding what is and what isn’t competition and fair pricing stands a fair chance of not actually playing out in any other fashion than simply being a price fixing commission. […]Because the NBN will only act as a wholesaler and treat all ISP retailers equally, ISP’s no longer have the ability to develop their own unique contracts that would reduce costs to consumers. All backhaul would be priced to all ISP’s at the same rate. So realistically no company has a significant advantage over the other. That does potentially create a good deal of choice, but that does not necessarily ensure competition. This would be akin to going to the grocery store and on the shelf were 5 different brands of soft drink, but every single brand tasted exactly like Coca-Cola. You would have a lot of choice in that situation, but there would be no real competition between those 5 brands, because taste is the competitive factor. For the Australian, this means that ISP’s will likely be forced to start bundling services to gain advantages over one another. Something that is not always considered attractive here stateside. 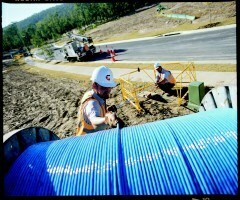 NBNCo is responsible for the deployment and installation of Australia's fiber to the home network. Brown must also still be living in Australia if he missed the parade of American providers repricing services to push people into “triple-play bundles” whether they want them or not. And we don’t even get the fiber to go with it. For most Australians, they no longer care whether it’s Diet Coke, Pepsi One, Cherry Coke, or even RC Cola for that matter — as long as it arrives on a fiber network built by and for their interests (instead of Telstra’s), it’s far better than what they have now. In reality, broadband issues hold a front-and-center position in Australian politics, and the Labor Government which supports an aggressive national broadband plan that puts America’s proposed broadband improvements to shame was -the- issue that keeps that government in power today. Why? Because Australia is well behind others in providing broadband access at reasonable speeds and prices. Australian private providers maintain a nice little arrangement delivering sub-standard, near-monopoly service at some of the highest prices around, all usage-limited and speed throttled. Despite years of negotiations with big players like Telstra, the privatized phone company, broadband improvement has moved at a glacial pace (too often by their design). While Australia ponders a fiber future, today’s broadband picture across the country is less idyllic. The minority of Australians receiving service over cable broadband, available mostly in the largest cities, continue to face usage-limited service and higher prices than American providers. Most Australians get their service from DSL connections offered by Telstra and third party companies leasing access to Telstra facilities. Telstra’s network is based almost entirely on aging copper wire that cannot deliver broadband to most rural populations. Telstra’s long term broadband plan for Australia depends on milking every last cent out of those copper wires while raking in even bigger profits from usage limited and expensive wireless data plans. Just last month, Telstra was fined $18.5 AUS million dollars for monopolistic behavior by impeding competitive access to its telephone network. No wonder the country had enough. Brown labeled the Australian government’s buyout of Telstra’s copper wire network a “negative,” as if they were stuck with a pig in a poke. That suggests Brown does not understand the actual plan, which relies on reusing existing infrastructure like poles and underground conduit to install fiber at an enormous savings — both in billions of dollars in reduced costs and deployment time. The alternative would require the government to obtain agreements with Telstra-owned facilities to share access or construct their own facilities from the ground up. Telstra has no incentive to spend money to upgrade their networks, much less decommission them. Logistically, the plan cuts through enormous red tape and guarantees Australians no one will be stuck waiting decades for the eventual retirement of copper phone wiring. Call it Fiber Optic Broadband for Copper Wire Clunkers — the government has not nationalized the phone network — it wants to buy it a fair price, from a willing seller who will be able to use the new network to deliver some of its own services. The horror show for groups like Digital Society is the thought private companies will actually be forced to deliver the competition and real savings they routinely proclaim in press releases, but never actually deliver to consumers. The Australian people will own the fiber playground private companies will play on, so why shouldn’t they have the benefit of oversight to make sure the game is played fairly? Australia’s Competition & Consumer Commission is equivalent to the Consumer Product Safety Commission, the Federal Trade Commission, and a state Attorney General all rolled into one. The ACCC is an independent statutory authority that works for consumers. It promotes and enforces real competition and fair trade. The ACCC’s involvement in broadband regulation includes: stopping false advertising, helping intervene and resolve disputes over access and billing issues, and being an impartial observer about broadband uptake and measuring how competition actually delivers better service and savings for consumers. In August last year, we sat down with the CEOs of the major telecommunication providers, Telstra, Optus and Vodafone Hutchison Australia. They acknowledged that there was a problem, exacerbated by a “race to the bottom” by industry participants in their advertising practices. The CEOs showed a ready willingness to resolve the issue on an industry-wide basis. headline claims relating to price, data allowances, total time allowances, speeds and network coverage, where the claims cannot generally be achieved by consumers. The three industry leaders have provided a court enforceable undertaking to review and improve advertising practices so that consumers are better informed about the telecommunications products they purchase. They have undertaken that their advertising will not make these claims in circumstances where they are likely to be misleading to consumers. Further the majors have also agreed that they will take reasonable steps to ensure that this commitment will extend to any other players with whom they have commercial agreements which allow them to control the advertising and promotion of goods or services. Australians are starting to receive consent forms for free installation of fiber broadband in their homes. I can see why Digital Society, a group partly funded by telecommunications companies, would object to the ACCC stopping Big Telecom’s ill-gotten Money Party-gains. ACCC also put a stop to promotions that tricked consumers into signing up for mobile data plans that included “free” netbooks, high value gas gift cards, or cash rebates. The Commission discovered these “promo plans” weren’t giving away anything at all — they simply added the retail cost of the “free” item to the plans’ charges. The ACCC received a court enforceable undertaking from Dodo Australia Proprietary Limited for the advertising of some of their mobile plans. Dodo had advertised that consumers would receive either an Asus Eee PC, a fuel card or a cash payment when they signed up to a ‘free offer’ plan. However, cheaper mobile cap plans that did not include the ‘free’ offers were comparable in value and services. After raising these concerns with Dodo, they promptly ceased publishing the ‘free offer’ advertisement and undertook to ensure the affected customers would receive the goods for free, either by way of cash refund or by reducing the monthly charges for the ‘free offer’ plans. That mean and nasty ACCC, ruining all of the fun for providers delivering tricks and traps for their customers. Caveat emptor, right? Australia traditionally has had low bandwidth caps. Even just five years ago while most Americans were enjoying unlimited bandwidth with their broadband connections, I was living in Melbourne, Australia and was limited to a 1GB cap per month via my Telstra connection. The likelihood of seeing 100Mb uncapped connections is highly suspect. Australians may enjoy these speeds, but they will likely be extremely expensive with low bandwidth caps or limited to high priced premium tiers. Brown can’t blame the private company that delivered his abysmal Internet service without his “free market knows best” philosophy falling apart. It wasn’t the Australian government that provided him a 1GB monthly usage allowance — it was Telstra, and five years later the company is still usage-limiting Australian broadband consumers. The National Broadband Network was designed to tackle that problem once and for all. Brown apparently doesn’t realize the last argument private providers have used to justify usage caps — insufficient overseas capacity — is being addressed by new super-high-capacity undersea fiber cables stretching across the Pacific. The issue of “usage cap” abatement is among the top bullet points for constructing the NBN. Brown would be right when he suggests that Australians may enjoy faster speeds, but with low usage caps and high prices — if Telstra was the only company providing the service. The new network will provide speeds faster than most Americans enjoy, with enormously expanded capacity. Providers like Telstra have an incentive not to deliver the unlimited service that fiber network can deliver, as it will reduce their profits. But since any company can access the network and compete, Telstra’s loss in market power will also erode their pricing power. When a consumer protection mechanism is added, Telstra won’t just be answering to their shareholders’ demands for greater value. They’ll also answer to the ACCC and the consumers who will pay for and maintain the network. That may not add up to mega-profits for Big Telecom, but it certainly makes a whole lot of sense to consumers and small businesses who will finally be able to get 21st century broadband at a reasonable price. Even worse for Digital Society’s friends — AT&T and Verizon — who fund the group through its connection with Arts+Labs, it might provide a blueprint for how America’s broadband future should be built. Telstra Faces the Consequences, Australia Has a Reality Check, But Where is Ours? Phillip Dampier June 22, 2010 Audio, Broadband Speed, Community Networks, Data Caps, Editorial & Site News, Public Policy & Gov't, Rural Broadband, Telstra, Video Comments Off on Telstra Faces the Consequences, Australia Has a Reality Check, But Where is Ours? It’s not as if the Australian government didn’t warn private broadband providers, notably Telstra. For the past several years, Australians have endured expensive, slow, heavily usage-limited broadband service that has put the country well behind many other Commonwealth nations. Australian Communications Minister Stephen Conroy finally warned the nation’s largest telecommunications provider if it didn’t move forward on upgrades and improved service, the government would be forced to step in to protect the national interest. Instead of improving service, Telstra spent years stonewalling the government and the Australian public, while banking high profits for broadband service. That’s a familiar story for North Americans, stuck with companies like Bell, Rogers, AT&T, Comcast and Verizon — all of whom seek ultimate control over what kind of service you receive, what you pay for it, and what websites you can and, perhaps down the road, cannot visit without paying a surcharge. Australia is closing the chapter on this story with a happier outcome for its 22 million citizens. Perhaps the United States and Canada could learn a thing or two from the folks down under. 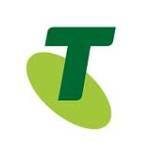 Telstra, a former government monopoly comparable to the American Bell System, was privatized in the late 1990s. Telstra looked to the United States for a chief executive that had experience navigating that transition. 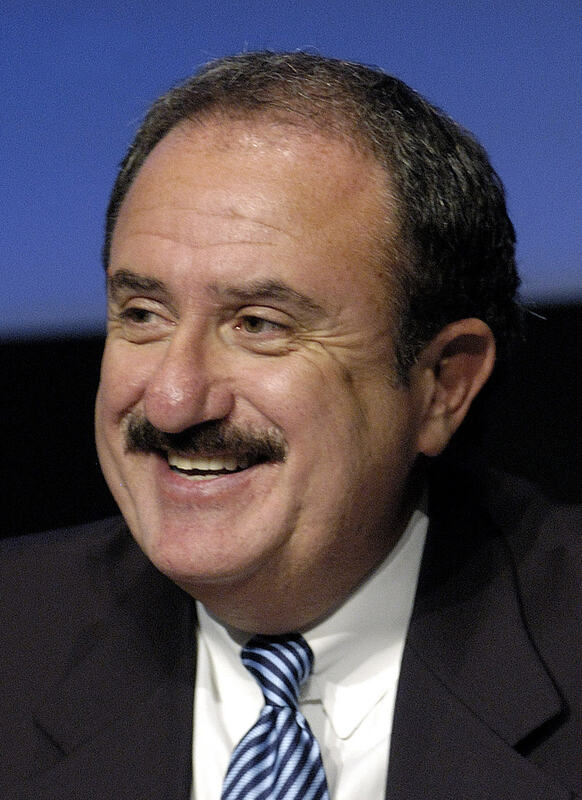 They found Sol Trujillo working his way up the management ladder at AT&T, finally culminating in chairmanship of former Baby Bell Qwest Communications. Would Trujillo like to take on the challenge of managing Australia’s largest phone company? Trujillo signed on with as Telstra’s CEO in 2005 promising to modernize the business and to bring American-style innovation to the South Pacific. Instead, Trujillo established an American-style rapacious oligopoly. In his first year at the company, Trujillo started an all-out war to get rid of Telstra’s organized labor, slashing 10,000 jobs to “save the company money” all while boosting his own salary. What started as $3 million in compensation in 2005 would rise to more than $11 million dollars just four years later, even as the value of Telstra declined by more than $25 billion on his watch. Trujillo alienated his employees and officials in the Australian government. Then-Prime Minister John Howard attacked Trujillo’s salary boost as abusive. Trujillo’s salary was 38 times greater than the highest official in Australia’s government. The average Australian retiree gets by on $219AUS a week. Trujillo had to make due with more than $211,000 a week. Customers weren’t exactly endeared to spending more of their money on Telstra products and services. Telstra had already embarked on cost controls for network upgrades, leveraged its monopoly power in many parts of the country with high rates for usage-restricted service, and bungled a critical application to participate in Australia’s National Broadband Network. 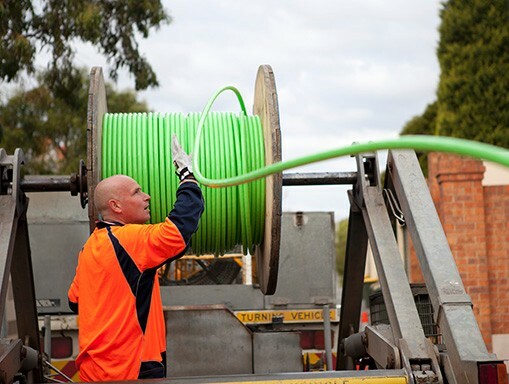 Australia’s National Broadband Plan, a roadmap for broadband improvements, set pre-conditions to involve small and medium-sized businesses in network construction. Trujillo balked, demanding that Telstra — and only Telstra — should have the right to determine what kind of network should be built in the country. More importantly, unless they exclusively ran it, the company would do everything in its power to block or destroy it. Internet Overcharging schemes limit enjoyment of broadband usage across Australia. 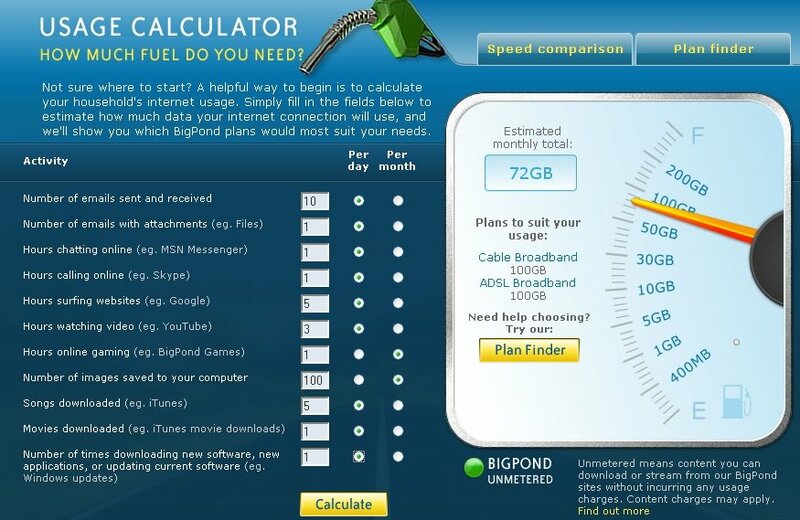 Telstra provides a usage meter estimator that includes all of the useless measurements for e-mail, images, and web browsing. But throw in some movie watching and the gas gauge really starts to spike. Telstra has employed a three-step strategy to muscle out any competition. It can be neatly condensed into three words: Bluster, Belligerence and Obfuscation. We [just] saw it again in spades. Telstra has been excluded from one of the most ambitious infrastructure projects announced by a Federal Government in decades: the construction of a national broadband network. Could it really be that Telstra’s board and management were so incompetent that they could not get past stage one in a tender process of this magnitude? After all, there were only four main criteria that had to be met. The first was the proposal had to be lodged in English. The second and third had equally low hurdles. Metric measurements – not the old inches, feet and miles – were required and the bid had to be signed. Nothing too difficult there. But the fourth criterion appeared to stump Telstra. It didn’t include any plan for the inclusion of small business. And so the Communications Minister, Stephen Conroy, was obliged to exclude Telstra, an announcement that shook 12 per cent from the value of the country’s biggest telecommunications company. This was no accident on Telstra’s part. It knew it was lodging a non-conforming proposal. Why, you ask? The answer is simple. Telstra does not want a national broadband network, particularly one that involves anyone else. That includes taxpayers. And if one has to be built, Telstra will do everything in its power to delay or kill the process. Yesterday marked stage one in a protracted war, ultimately designed to defeat one of Prime Minister Kevin Rudd’s key election promises. Trujillo claimed yesterday that Telstra had been unfairly excluded from the process on a technicality. That’s just rubbish. In recent months, the company, its chairman, Don McGauchie, and Trujillo repeatedly threatened to walk away from the tender process, and lodged the proposal only a few hours before the deadline. Trujillo’s rhetoric yesterday was laced with the usual mixture of bravado and threats. He compared Australia to North Korea or Cuba. He declared only Telstra was capable of building the type of network required by the Government. The message is clear. Telstra will launch legal action at every opportunity – and even when there aren’t opportunities. That time-honored American practice of simply suing your way through any legislative or regulatory roadblocks threatened to come to Australia. The exclusion of Telstra from such a revolutionary broadband project didn’t sit well with the board or shareholders, and directly led to Trujillo’s ouster in 2009. By then, he had alienated customers, the government, and just about everyone else. Perhaps the government would allow a second look at a Telstra broadband application if it was submitted by someone other than Sol Trujillo? It couldn’t hurt to find out. Just weeks after leaving, Trujillo decided to settle scores with Australia, telling reporters that he thought the country was backwards and racist. Telstra spent the summer of 2009 attempting to heal the Trujillo-caused wounds with conciliatory statements in the Australian media. Telstra’s new chief executive, David Thodey, admitted the company’s customer service record needed improvement. He distanced himself from some of the more caustic comments from the former CEO, and claimed the company was on-track to be a major participant in improving Australia’s broadband experience. 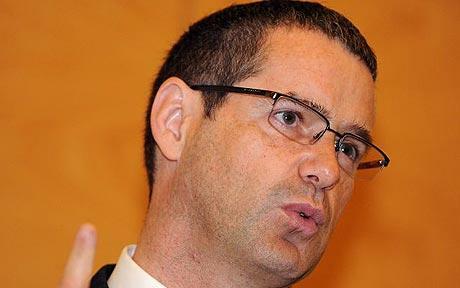 But as the months progressed, Australia’s Communications Minister, Stephen Conroy ultimately concluded he was getting the lip service treatment that Telstra had delivered Australians for years. Conroy, already suspicious of the company’s control-minded tendencies, quietly began bending the ear of Prime Minister Kevin Rudd. Conroy had watched Telstra’s steadfast refusal to work constructively towards a National Broadband Network (NBN). By last summer, the company was making proposals for underwhelming broadband expansion. Fiber optic broadband was unnecessary and expensive, they said. Besides, the service Telstra was providing was already good enough. Australians didn’t agree. Part of the platform that brought the Rudd government to power was the promise of better broadband service in Australia. Waiting for Telstra to provide it was a futile exercise. Conroy told Rudd the government should not be setting its broadband policy agenda based on what worked most conveniently for private providers. If they won’t move, then let’s get them out of the way, Conroy suggested. Rudd, working for the interests of the Australian people — not just a handful of telecom companies seeking riches with substandard service at monopoly prices, agreed. After reviewing the proposals submitted to design and construct 21st century broadband service for Australia, Rudd dismissed them all, calling them inadequate. The government, he announced, would go it alone and build the network itself — delivering a fiber to the home network for 90 percent of Australians on an open network available to any provider that wanted to rent access at wholesale rates. More importantly, Conroy was not going to allow Telstra to continually block progress on the NBN. Conroy was not some supine minister willing to compromise away the goal of super-fast affordable broadband. His critics called him Machiavellian, slashing and burning anything that stood in his way. But Conroy was steadfast — corporations would never be allowed to dictate broadband terms to the government. He warned Telstra to cooperate or face the consequences. Telstra continued to stall and stonewall, and last September, the Rudd government delivered what it promised — a forced break-up of Telstra. The company was given a choice — either sell back its copper wire landline network to the government or divest itself of satellite TV service Foxtel and lose access to any additional wireless mobile frequencies for Telstra’s cellular service. The equivalent in the United States would be to declare fiber to the home to be in the national interest, and if AT&T and Verizon didn’t deliver it to nearly every home in their service areas, the government would move in and do it themselves, taking back ownership of the AT&T and Verizon’s infrastructure along the way. Monday marked a day in history for Telstra, agreeing to sell back its copper wire landline business (for which it will receive $11 billion in compensation). In return, Telstra is assured wholesale access to the new fiber broadband network, and can market products and services on it. It cannot, however, serve as a gatekeeper to keep competitors out nor maintain virtual monopoly service, especially for less suburban and rural customers. Some telecom analysts believe the deal is actually good news for Telstra, if they’d see beyond their control tendencies. After all, they say, Telstra gets to rid itself of a legacy copper-wire landline network that is expensive to maintain and serves a dwindling number of consumers, many who have switched to wireless. They also get to develop and market new high bandwidth applications on a network they are no longer responsible for financing. It’s a win for the government as well who gets a single, national fiber network built in the public interest, which makes it far easier to recoup the billions in costs to build it. They’ll even likely make a profit suitable to defray the costs of subsidizing wireless broadband service for Australia’s rural residents, to be served with at least 12Mbps connections. No cost-recovery fees on customer bills, no usage limitations that restrict innovation, and broadband that serves everyone, not just a handful of corporations that seek to monetize every aspect of it. Conroy wouldn’t think much of America’s National Broadband Plan, which relies near-exclusively on private providers voluntarily doing the right thing. Conroy stopped putting blind faith in Australia’s large telecommunications companies. The Obama Administration hasn’t. We’ve seen millions spent lobbying to permit a handful of providers to control broadband service on their terms. Few will provide fiber to the home service and many are content leaving rural Americans with dial-up service. With dreams of Internet Overcharging schemes to manipulate usage to maximize profits even higher, things could get much worse. What’s right for AT&T isn’t right for us. For Australia, who has lived under such monopolistic broadband regimes for over a decade, a National Broadband Network without arbitrary usage limits and available to all — rural and urban — is the promised land. It will leapfrog Australia well ahead of the United States and Canada, with far faster speeds and better prices, all because a government stood up to a corporate provider that preferred to overpay its executives instead of getting the job done right. Australia had a reality check — broadband is a utility service necessary for every citizen who wants it. Just as electrification and universal phone service became ubiquitous in the last century, broadband will also join those services in the years ahead as commonplace in nearly every home. If only the strength and conviction that is fueling Australia’s broadband future could also be found in the United States, where too often what is urgently needed today gets frittered away into “maybe we can have it someday” compromises with big telecom and their lobbyists. That isn’t good enough.